Last night I cheated, twice. This first was by not posting a blog when I’m participating in National Blog Posting Month (and at this time I’m trying to figure out if I’m going to back-date this post or just make up for it later). The second was I ate non-paleo food and drinks. But I have a good reason why – John and I spent the evening at a friends house helping them choose their signature cocktail for their wedding this spring. And while I could have chosen a paleo-friendly drink recipe, what good would my taste buds have been if I didn’t taste all the other cocktails and vote for my favorite? And then, what kind of friend would I have been? 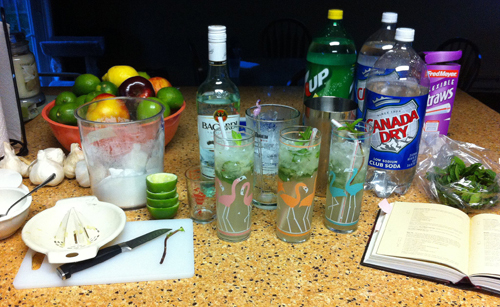 Earlier this year, I decided to make homemade mojitos for the annual BBQ we host for our CrossFit friends. What I didn’t know was how impressive this skill would be until I posted a photo from the ‘dress rehearsal’ on Facebook and received a ton of comments about how hard it was to make a mojito at home and awe that I took on such a challenge. I’ll let you in on a little secret – all I did was crack open a bar book that I received as a gift for my 21st birthday and choose the mojito recipe that was the easiest to make. I bought key lime and mint from the corner produce market, a gallon of Bicardi Rum at the liquor store, and everything else at the grocery store. Turns out that the key limes were key in making the drink sweet and not sour (which would have been the case if I used regular limes). Shaken, not stirred – Shake the lime juice, sugar, mint leaves, and rum vigorously with ice. Without straining, pour the entire contents of the shaker into a highball glass flamingo glass, and top with club soda. Garnish with the mint sprig. Complete with a straw. Other than the mint sprigs, measure out each of the ingredients to keep the ratio (and taste) perfect. Recipe adapted from the The Ultimate Bar Book: The Comprehensive Guide to Over 1,000 Cocktails (link to recipe). The thing that surprised me the most about serving about a gallon’s worth of mojitos at my party was how much people are in awe of special skills like cooking or following a recipe. I experience this whenever I bring a homemade pie to a dinner party. From what some of my friends tell me, it’s like this – people who can follow a recipe usually can because someone showed them how to at one point in their life. And as I’ve learned from making pies and now cocktails from scratch, if you want to learn how to do something, all you need to do is find the directions and learn how to do it. What’s the best cocktail you’ve mixed at home? And what’s the recipe? This entry was posted on Sunday, November 6th, 2011 at 6:22 pm and is filed under life & observations. You can follow any responses to this entry through the RSS 2.0 feed. You can leave a response, or trackback from your own site.